How I Use My Bullet Journal. 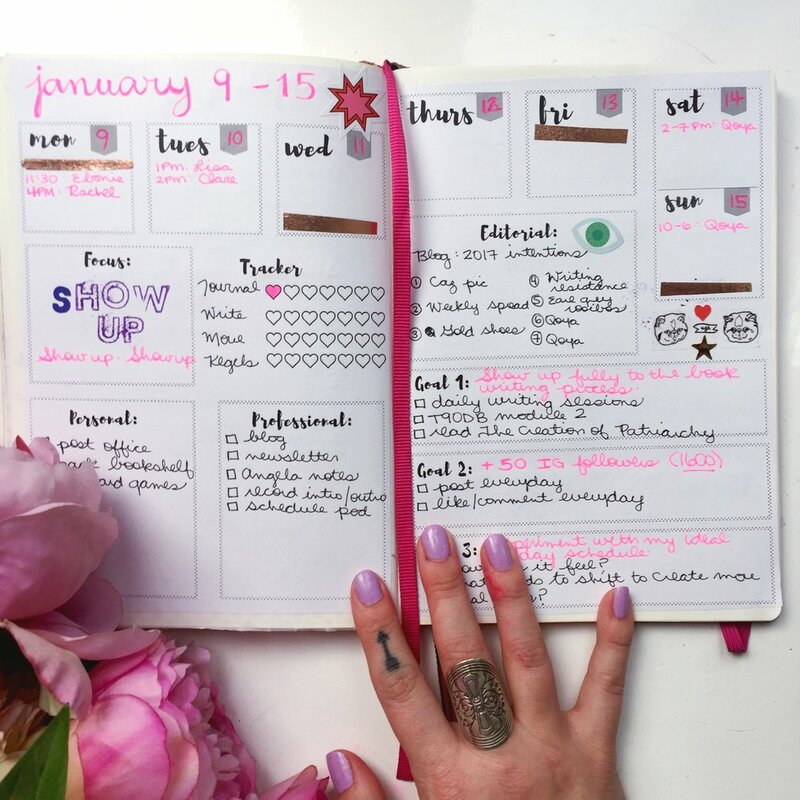 Looking at all of the beautiful inspiration on Instagram, it's easy to get confused about how to start a bullet journal or to think you're not artistic enough. I'm here to assure you that nothing could be further from the truth! I've even created a tutorial and printables of my spreads so that you can simply grab a notebook and get started (you can download them for free here). I used to organize my life in a pretty pink Filofax and then I became an avid Passion Planner but bullet journalling is by far the planning system that works best for me. It appeals to my endless need to tweak, customise, and decorate. Rather than having to choose one particular system or tool, I’m able to mix and match the components that work for me, in each season of my life. Instagram is filled with #BuJoInspo that looks like it could be hung in an art gallery. This is so much fun to look at but it’s really intimidating when it comes to starting your own bullet journal. For some, a bujo is a creative outlet. But for me, writing, photography, and cooking already serve as fulfilling creative outlets. I’m all for prettying up the pages with washi tape, stickers, and coloured pens but ultimately it needs to be an effective tool for organizing my time, reaching my goals, and designing a life that feels how I want it to feel. To get started and beat the overwhelm, I watched this 3-minute video from the official Bullet Journal website. I’d recommend you do the same. I’d recommend you do the same. It will walk you through the core components of the bullet journalling system including the key, future log, and rapid logging. It’s great to get started using the system in it’s purest, simplest form and then you can decide what elements you want to keep and what you want to customize. This is the first spread in my first bullet journal. Other than my pretty pink pen, it couldn’t be any plainer or simpler. You don’t need to be artistic to start a bullet journal; this system is available to everyone. All you need to start bullet journalling is a notebook (literally any notebook) and a writing device (literally any writing device). It’s easy to think you need the “right” notebook or the “right” pen but whatever you have access to will work. That being said, I totally ordered the fancy Leuchtturm 1917 that so many bullet journalers rave about. But I promise, you really don’t have to. Don’t let it be a barrier to entry. I still draw my monthly layouts by hand as a) they’re really simple and b) as the dates change every month, they’re a little hard to standardize. 3 goals for the month and the action steps I’m going to take to reach them. These are usually subsets of the major goals I’m currently working towards. At the start of the year I mind mapped out my big annual and 90-day goals (check out this article to learn about my mind mapping process). The other process I go through each month is a mini reflection that helps me look back on the month that’s just passed and the one that’s coming up. This allows me to make small tweaks and course correct throughout the year rather than getting to December and realizing I’ve a) not accomplished anything I wanted to or b) spent the whole year chasing goals and feelings that no longer make sense to me because I never re-examined them. How did I take care of myself this month? What do I need to do/be/have to feel how I want to feel? It’s a bit of a longer process but feels more helpful and thorough so I’ll report back on how it goes (watch this space). My weekly layout lets me see at a glance what appointments or date-specific tasks I have on during the week. I use the tracker to keep tabs on any habits I’m wanting to daily or at least regularly. I’ll often set alarms in my phone to serve as an extra prompt to do these. I’m really careful not to use the tracker as a stick to beat myself with if I’m not doing them as consistently as I’d like. It’s simply information that I can use to assess whether I’m keeping the habit in the way I want and if not, I can reflect on why. The personal and professional to-do lists are pretty straight forward. I start filling them out by looking at my monthly brain dump and then fill in anything else that’s come up for the week. I keep track of my client to-do’s on a separate page because keeping track of an additional 6 lists on one spread would be a hot mess. The editorial box is where I plan my blog and Instagram posts for the week. If this isn’t relevant to you, you could relabel it for anything you want to plan each week (ie. meals, workouts, self-care, etc.) Just stick some washi tape over the heading and write your own! I also set three goals for the week (usually subsets of my larger monthly goals), which I also break down into action steps. My daily spread borrows tools that I’ve found useful from books like Eat that Frog, The Desire Map, and Code Red. Fill in the date at the top and then I write my monthly mantra underneath. I find that the daily repetition really helps keep it at the forefront of my mind so that I’m thinking about living it each and every day. The lines on the righthand side are to take an inventory of my daily “SHE-scape,” a practice I learned while taking Lisa Lister’s re:Wilding course. I write down the phase I’m at in my menstrual cycle (ie. day 1, or right now, the date of my pregnancy, ie. 19+2), the phase of the moon (I use the iLuna app to find this), the season that it is outside (ie. winter), the phase I’m at in my life (ie. creatrix/mama …Lisa’s book Code Red is a really good resource for learning more about what I mean by this), and I draw a tarot card that I make note of. All of this information gives me insights into the (often competing) forces that might be influencing my mentally, physically, spiritually, and emotionally. It’s also a really good way of reminding me to live more in tune with nature’s and my own body’s naturals seasons and cycles. My MITs are the Most Important Tasks I need to complete that day. They’re usually the things I want to avoid, that have an impending deadline, or are urgent in some way (you might find the Eisenhower Principle useful for determining your MITs). I always make sure to set up my day so that I tackle these tasks first. The to-do list includes anything else that needs to get done that day. Afterwards I decide how I want to feel that day (this often comes through clearly in my meditation or tarot draw) and I write down what I can do to feel this way in each area of my life. At the end of the day (or the following morning), I write down three (very specific) things I’m grateful for and I chart my cycle. Charting just includes brief notes on how I felt physically, mentally, emotionally, and spiritually. This practice creates a guidebook to your menstrual cycle (again, Code Red is your best friend here). I’ve continued charting throughout my pregnancy as I’m curious to see what patterns emerge. This is a quirky, compelling novel that wasn’t at all what I expected. Set in Amsterdam in the late 17th century, Nella moves to the city to live with her new husband, a famous merchant from a mysterious family. Things are not as they seem and she begins to receive packages from a miniaturist that appear to be prophetic; at times they're comforting and at others terrifying. Nella becomes obsessed with unravelling the mysteries of her new family and the miniaturist, and as she does so she begins to step into her own power. This is a beautifully written piece of fiction that transported me to another world. I’d been anxiously anticipating Rebecca’s new book since my recent interview with her her. This book is written in a similar snippet-style format as Rebecca’s first book. 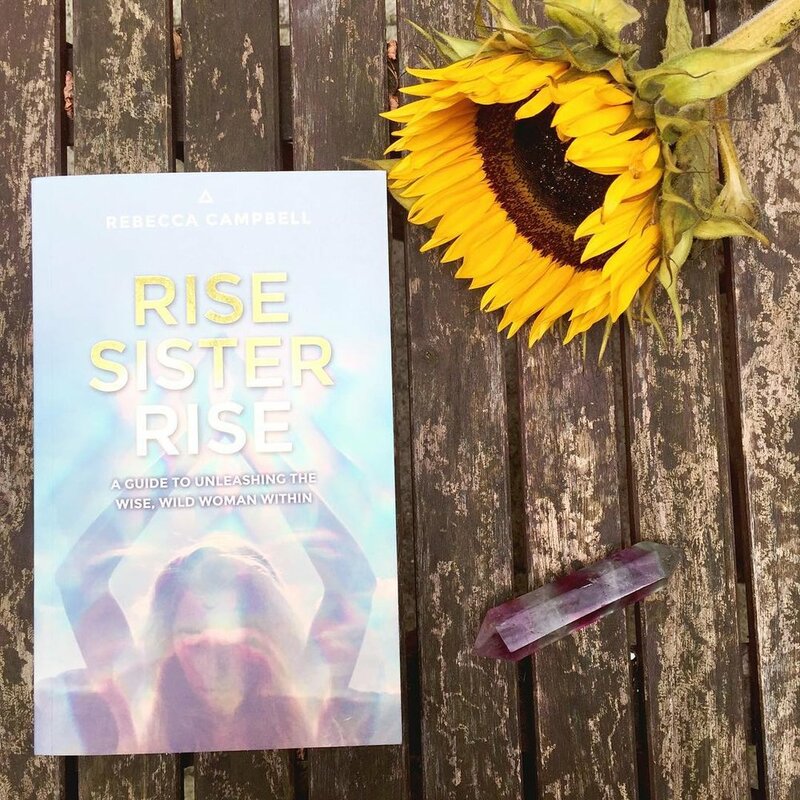 In it she shares her own journey, wisdom, and practical tools for tapping into your own inner wild woman and honouring your cyclic nature. I’m really glad to have read it as there were some great insights for me, thought-provoking questions to consider, and I especially loved the heartfelt prayers that are peppered throughout. However, I do tend to like a meatier writing format and think this book is better suited to someone who is perhaps just starting out on their spiritual journey or hasn’t considered these subjects before. Oh wow - now this is storytelling! We begin at Eva and Jim's first encounter at Cambridge in 1958. But from there the story breaks off in three different directions, asking the question: what if? What if life had gone that way instead of this? What if we had done something other than what we did? We follow these three trajectories throughout their lives, finding out that some threads follow us no matter what but the choices we make and the people we love shape who we become in such profound ways. This story is beautiful and bittersweet and had me thinking deeply about the paths we take in life - those we choose and those we don’t. I love a good bit of YA fiction and that’s exactly what this novel delivers! Set in Cornwall, it’s a story with witches, romance, and mystery. When River moves to a new town with her mom in order to escape their past, she doesn’t feel like she fits in. But she becomes obsessed with the infamous Grace family - who are magnetic and beautiful and rumoured to be witches! As their lives begin to intertwine she learns about friendship, her own power, and the dangers of magic. It’s a fun story that kept me turning page after page; I had a lot of fun reading it while we were away for the weekend recently. Told in a style that marries poetry and prose, Eve Ensler writes candidly about the lifelong dissociation from her body that she experienced after being sexually abused as a child. Through her work with women in the Congo she is faced with the horrific violence that is being inflicted on their bodies. And she is soon brought back into hero own body through a cancer diagnosis and this memoir is a beautiful, heartwrenching account of that experience. But it also has a much larger message, drawing parallels to the violence being inflicted on women’s bodies to the violence that is being inflicted on the world and insisting that if we are to heal on a global level, we must reunite with our bodies. I really loved this book but I would warn that there are some very graphic stories about violence towards women and children. One in particular feels like it’s burned into my brain and while I think it’s important to be informed, I also know this might be very difficult to deal with for other people who are as sensitive as me so I wanted to offer that warning. Ways to Feel My Feelings. I've seen so many people write so beautifully about "going into their pain," "staring it in the eye," "wading into its depths." I recently posted a video about how important it is to fully feel and express our feelings. It's critical to our health on every level and not doing so can be devastating. My recent work with a coach has allowed me to explore the trauma I've been experiencing in my body and it's dredged up old pain that is demanding to be felt. But when all of these poetic words spring to mind, it has made me feel impotent. Do I even know how? Certainly no one ever taught me. What about those times when life must go on in spite of difficult feelings? Or when these feels take up residence for long periods of time - demanding to be felt and unravelled slowly? Lie in bed and let them wash over me without trying to do or force anything. Explore it as a felt sense in my body: Where is it located? How big is it? Texture? Sensations? Density? Colour? Age? Write into it - its origins and its lessons. Move my body - dance, run, beat my fists, throw myself on the floor; it all counts. Emote it; let those primal sounds overflow. Create something with it. Get messy with paint. Make a mandala. Dig a big hole in the garden. What does it want to be in the world? What shape does it want to take? Have an honest conversation. Conversation is so healing. Hold it with you and let it be present with you as you go about your day's activities, not using them to numb it out. I've even taken to cradling it like I would a baby when I can. Bringing metaphor to our spiritual practices is a beautiful way to evoke the layers and depth they bring to our lives. But these metaphors become dangerous when they're not anchored to our lived reality, when we're no longer sure what they really mean. So let's write poetry but let's also write the bare bones truth of what our lives look like. What's working for us and what isn't. Even when it's messy and incomplete and we aren't sure what we're doing. That's where the real poetry is. Please tell me: what does it look like to feel feelings in your life right now?